Description: Illegal usage of 2 cent US Documentary stamp as postage postmarked BAYONNE, N.J., DEC 13, '98, 2 PM sent to New York City, NY. 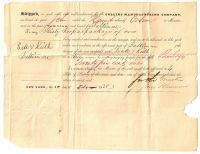 Description: Stampless folded letter postmarked red BOSTON, MS., DEC 7 with matching PAID and manuscript "8" rate sent to Salem. Description: Stampless folded letter postmarked red fancy SAVANNAH, GEORGIA, DEC 5 with manuscript "25" rate sent to Boston, Mass. Letter mention ship Plato. Description: Stampless folded letter postmarked HOLLY SPRINGS, Mi., DEC 11 with manuscript "5" rate sent to Memphis, Tenn. 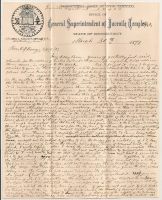 Description: Stampless folded letter posmarked blue fancy UTICA, N.Y., MAR 4 with matchng "V" in circle rate sent to Willink. 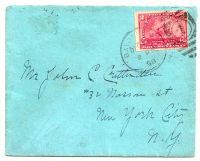 Description: US #11 on cover held by wax postmarked ELIZABETH, N.J., sent to His Excellency Martin Van Buren, Ex President of the U.S., Kinderhook, New York. Description: US #26 on folded University of Virginia student report postmarked blue UNIVERSITY OF VA., VA., NOV 3 sent to Erin Shades, Va. Description: Stampless folded letter postmarked red CHARLESTON, S.C., OCT 18 with matching "25" rate sent to New York City, NY. 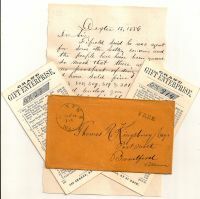 Description: Stampless folded letter postmarked red MOBILE, Ala., JUN 18 with matching PAID and 10 in box sent to New York. Description: Stampless cover postmarked red NEW-YORK , SHIP, NOV 24 with manuscript rerated from "52" to "27" rate sent to Charleston, S.C.. Description: Stampless folded letter postmarked red SAVANNAH *GEO* NOV 1 with manuscript "25" and "1" rate sent to Boston, Mass. Description: US #10 grid cancelled on folded letter sent from "New York" postmarked red NEW YORK & PHILA., R.R., JAN 28 sent to Philadelphia, PA. Description: Stampless folded letter sent from "New York" handstamped red STEAM BOAT with manuscript "12" rate sent to Albany, NY. 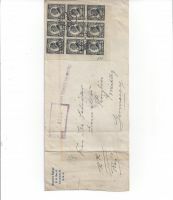 Description: Stampless cover postmarked blue WILMINGTON, N.C., APR 9 with matching PAID 10 sent to Hampden, ME. Description: US #205 on cover postmarked STATION A, BOSTON, NOV 7, 8 P.M., sent to Wailuku, Maui, Hawaiian Isles. Rec'd backstamps on verso. 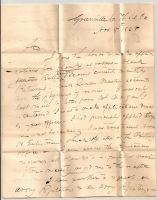 Description: Stampless folded letter postmarked red BOSTON - MS., 7 stars * with manuscript "10" rate to Providence. Description: Stampless cover postmarked AUGUSTA, GEO., PAID, APR 2 with matching PAID and manuscript "30" rate sent to Styria, Austria. Description: Stampless folded 3 page letter postmarked red SAVANNAH, Ga., DEC 4 with matching "10" in cirlcle sent to Sparta, Georgia. Description: Stampless folded letter postmarked red SAVANNAH *GEO* JUN 4 with matching "10" in circle rate sent to Henry M. Morfit, Washington, D.C.. Description: Stampless folded letter postmarked red SAVANNAH *GEO* SEP 27 with matching "10" rate sent to Boston, Mass. 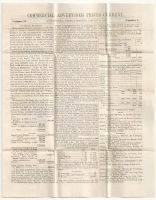 Description: Stampess folded letter postmarked red SAVANNAH *GEO* DEC 12 with manuscript "25" rate sento to New York. Description: Stampless folded letter postmarked SAVAN., GA., JUN 12 with manuscipt "25" rate sent to Bethlehem, Pennsylvania. 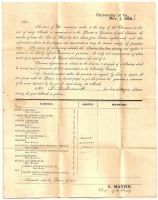 Description: Stampless folded letter postmarked red SAVAN, GA., FEB 6 with manuscript rerate from "12" to "free" sent to Charleston, SC. 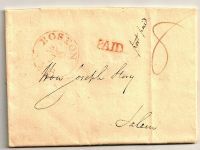 Description: Stampless folded letter postmarked red SAVAN, GA., APR 17 with matching PAID and manuscript "25"rate sent to Middletown, Connecticutt. Description: Stampess cover postmarked SACRAMENTO CITY , Cal., with matching "10" rate sent Port Gibson, New York. Description: Stampless cover postmarked red THEO. SEMINARY, Va., OCT 29 with matching "5" sent to No.4 Library Street, Philadelphia, Pa. Description: US #68 on cover postmarked CHARLESTON, S.C., MAR 6 sent to London, Canada West with backstamp on verso. Description: US #65 on cover postmarked VICKSBURG, MISS., JAN 30, 1864 with matching grid cancel and DUE 6 sent to Philadelphia, Penn. Description: Stampless folded letter from "New York" with red STEAM BOAT handstamp sent to Blandford, Mass. Description: Stampless folded letter sent from "Albany" handstamped red STEAM BOAT sent to New York.